Want to give us a call? Just tap which location you would like to call. A city car that's good looking, has plenty of space on offer considering its size and class, and comes packed with equipment. The Suzuki Celerio is affordable to run and perfectly suited for life in the city thanks to its compact dimensions, economical nature and agile handling. 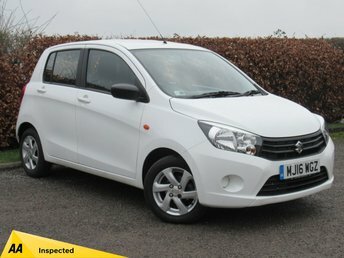 Discover it from behind the wheel by arranging to test drive one of the used Suzuki Celerio models for sale in Stockport at Stockport Car Supermarket. All of our used cars are put through a thorough inspection process before going on sale so you can be sure of finding a quality car that's attractively priced. Contact a member of the team today for more information or simply begin your search here on the website. Finance is available to UK residents aged 18 years or older, subject to status. Terms & Conditions apply. Indemnities may be required. Other finance offers may be available but cannot be used in conjunction with this offer. We work with a number of carefully selected credit providers who may be able to offer you finance for your purchase, commission may be received. We are only able to offer finance products from these providers. Postal Address: Stockport Car Supermarket, 392 - 398 Buxton Road, Great Moor, Stockport, Cheshire SK2 7BY. Find contact details here.